Laura was born and raised in Southern California. She graduated with a Bachelor of Arts in English with Honors from San Diego State University. Upon graduation, she began pursuing a legal career when she received a post-graduate Paralegal Certificate with Honors in General Litigation from University of San Diego before earning a Juris Doctorate from Thomas Jefferson School of Law in downtown San Diego. 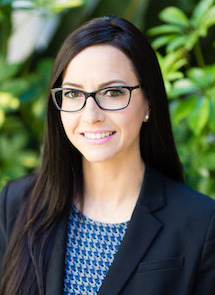 During her time at Thomas Jefferson School of Law, Laura developed a passion for alternative dispute resolution and served as a Student Mediator at San Diego Small Claims Court. She also earned academic achievement awards for Advanced Mediation, Trial Advocacy, Juvenile Justice, and Criminal Law courses and consistently remained in the top 30% of her class, which earned her a spot on the Dean’s List. To gain trial experience, Laura participated in externships at the Office of the San Diego City Attorney and Office of the San Diego District Attorney and was offered a Post-Bar Graduate Law Clerk position with the San Diego City Attorney’s General Trial Unit. Laura is a current member of the San Diego County Bar Association, Los Angeles County Bar Association, Consumer Attorneys of California, Consumer Attorneys of San Diego, and Thomas Jefferson School of Law Alumni Association. Prior to Law School, Laura was a National and International Competitive Figure Skater who competed in Ice Dancing for over 20 years. She became a two-time United States Junior National Champion in 1998 and Intermediate Dance Champion in 2001, which earned her a spot on the United States Olympic Developmental Team. In her spare time, Laura enjoys travelling with her husband who is an Active Duty Military Service Member in the United States Navy and entertaining her two young children.